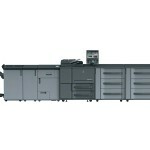 Take your digital printing to the professional level. Introducing the all-new bizhub PRESS 1052 - the digital printing answer for all your firm’s needs. With an output of 105 ppm and 14,000-sheet max paper capacity, the 1052 is more than equipped to keep up with the demands of your firm. Introducing the bizhub PRESS 1250 – a high-volume digital press that prints, copies and scans. With a monthly duty cycle of three million impressions, 125 ppm output and 14,000-sheet max paper capacity, the bizhub PRESS 1250 delivers a higher level of productivity.